All was not well at WPP during Martin Sorrell's final year in charge and, as the first anniversary of his shock exit looms, revenues keep sliding. New chief executive Mark Read is warning of a third year of decline in 2019 and a long turnaround in prospect. "It has been a hair-raising year for WPP." So says Claire Enders, founder of Enders Analysis, as the first anniversary of the acrimonious exit of former chief executive Martin Sorrell approaches in April. Mark Read, who took over from Sorrell last September, has made structural and management changes in a bid to distance "the new WPP" from its talismanic founder and return the company to growth. He maintains WPP has "made good progress" in simplifying the group and making it "more client-centric" but the numbers tell a brutal story. Net sales, known as like-for-like revenues less pass-through costs, dropped in the last four quarters of Sorrell’s reign, and they have continued to slide, with the exception of Q2 2018, when there was a brief uptick. When WPP reported its annual results at the start of this month, it said net sales fell 0.4% in 2018, little better than the 0.9% drop in 2017. "Business performance hasn’t changed materially since Sorrell exited," Jonathan Helliwell, an analyst at Panmure Gordon, says. "WPP continues to look like a super-tanker, sailing in the direction of maturity, turning the wheel to re-orient for changing markets, but with a very big turning circle." 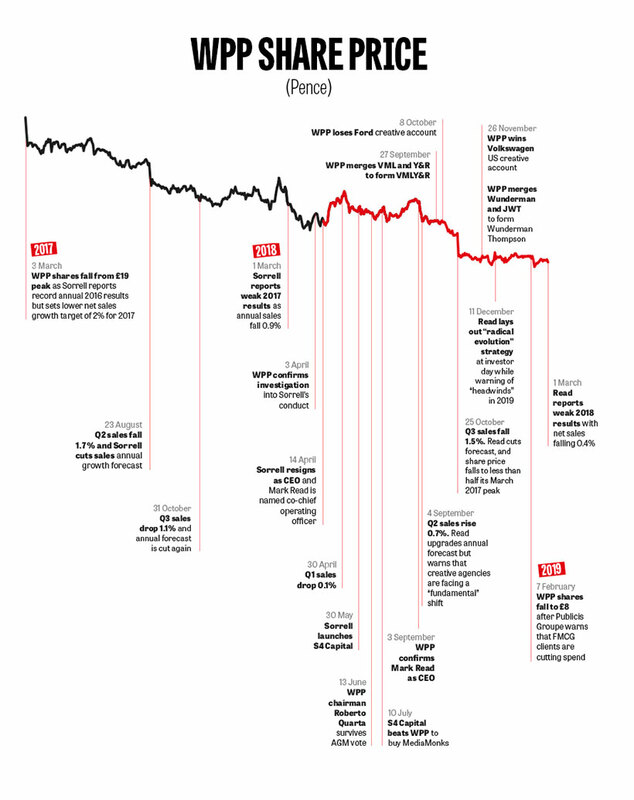 WPP is facing a third consecutive year of decline in 2019, with Read warning that net sales will fall between 1.5% and 2% as losses such as the Ford creative and GSK media accounts take their toll. The first six months are likely to be the toughest. There will be a "pronounced worsening" in North America, says Read. However, he gave some cheer to investors at the annual results by sticking to his forecast that organic growth will match rivals by 2021, which suggests this year will be the nadir. WPP’s shares have suffered a dizzying decline. During Sorrell’s final year in charge, the stock price plunged from £19 to £11 between the time of the annual results in March 2017 and his exit at the start of April 2018 (see graph below). The stock has tumbled further in the post-Sorrell era, touching a low of £8 in February when Publicis Groupe warned of renewed pressure on creative agencies. So, over two years, WPP’s stock market valuation has more than halved from £24 billion to £11 billion. "That share-price drop has been a hugely material backdrop to WPP’s activities," Enders says, adding that Read and his team "have had to do everything they can to steady the ship." All the while, Sorrell has been causing trouble on the sidelines, sniping at his old company and starting a marketing services business, S4 Capital, just six weeks after departing WPP. He was able to do so because he had no non-compete clause attached to his exit. Read (pictured, right) has promised "radical evolution," declaring: "In the past, we have been too slow to adapt, become too complicated, and have underinvested in core parts of our business." He acknowledges feeling a sense of "urgency" after last year’s Q3 results, when growth faltered, because "it was clear that there was quite a lot of work to do." Investors appear to have given Read some breathing space as the shares have stabilized after the latest annual results. Read has a reputation for being an inclusive leader, and allies say he is "relaxing into the role," albeit a demanding one. He says, "It’s a fantastic company and there’s lots to do. It’s a busy time and I am enjoying it." Enders thinks Read has made a decent start, given the difficult circumstances of Sorrell’s abrupt exit and the fact that the former chief executive, who built and ran WPP for 33 years, was famously controlling. Investors used to warn about the "Sorrell-centricity" of WPP under the former chief executive, and Enders says, "You cannot underestimate the difficulties in transitioning the company from a founder-manager to a very different management style." According to Enders, the fact that Read and some of his senior lieutenants, such as COO Andrew Scott, have taken over the running of WPP relatively smoothly "shows Martin hired good people." 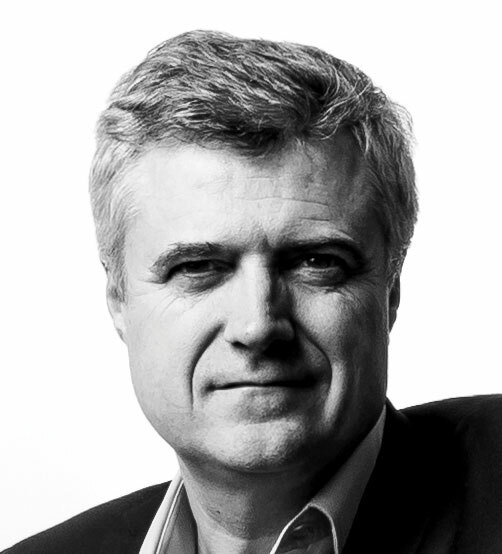 Read’s early moves have included restructuring two of WPP’s struggling creative networks: he united Y&R with VML to form VMLY&R, a move that Sorrell said he was planning before his exit, and merged JWT with Wunderman to form Wunderman Thompson. He has also announced a sale of "non-core" assets, such as a stake in Kantar, to simplify the sprawling group and cut debt. In addition, 3,500 jobs are to be cut out of a 130,000-strong global workforce, with the merging of 100 offices and the closure of another 80. In December, Read used an investor day to set out his vision for WPP as a "creative transformation company," complete with a new logo, and focused on four growth areas: communications, experience, commerce, and technology. But he kept expectations low with that promise to match the organic growth of its peers only by 2021. Enders says, "I’m a little disappointed the company did not present a plan that was more ambitious." However, Helliwell says that "it’s not easy to see how Mark can be more radical on a ‘standalone’ basis" and Read would have to try large-scale M&A, perhaps with a management consultancy, to drive drastic change. Helliwell adds, "He’s moving in the right direction, but he has to tread a balance between playing to the existing strengths of traditional agency brands – relationships, big ideas, network – and improving their perceived weaknesses of digital expertise, cost, transparency." One CMO at a major WPP client who has spoken to Read says, "Mark is really trying to shake things up. There’s a lot of energy internally to change and simplify and pivot. I think he has a strong appetite to quite radically change where WPP makes its money – to look at what the services of the future and the high-margin businesses of the future are." Read maintains that the agency sector is going through "structural change," not "structural decline," but he needs to retain and win clients to prove that WPP is able to change. The loss of some key accounts, including Ford, GSK, and American Express’ media, were setbacks last autumn, even if winning Volkswagen’s creative in North America was some compensation. Other big WPP clients such as Unilever and Vodafone are forcing change by bringing marketing services in-house and cutting agency fees. In a sign that Read recognizes that WPP must rethink how it serves clients, he invited Keith Weed, outgoing chief marketing and communications officer ar Unilever, to speak at the investor day in December about the need for agency groups to be less siloed and more agile. "You have a whole suite of capabilities in all of the agencies you have but, actually, you are making us [the client] do the work of pulling it together," Read was told by Weed on-stage. "And if you could pull it all together and have an integrated offer, not only would it be more consistent but there must be ways of creating efficiencies both on your side and our side." British Gas owner Centrica’s integrated review in the U.K. and North America is likely to be a test for Read’s new approach in the first half of 2019. He anticipated the rise of clients taking marketing services in-house when he was global chief executive of Wunderman, and set up on-site agency arm Wunderman Inside at the start of 2018. Still, he said at this month’s results that clients "underestimate" the challenges of in-housing, particularly digital media, and played it down as a widespread threat. Some clients may disagree. One advertiser that has in-housed some of its services says it was surprised to find its WPP agency "didn’t know how to support or drive it." Read does see some cause for optimism that "clients realise they need to invest in marketing spend" to support their brands, after Kraft Heinz ran into financial trouble by slashing costs. Sorrell courted the limelight when he ran WPP and he was always going to leave a vacuum because he shaped the company in his own image and prided himself on dealing directly with clients. Read, who got his first job working for Sorrell in 1989 and stayed loyal to WPP, bar a seven-year break in consulting and a dotcom start-up around the turn of the century, has made it clear he intends to invest in the parent company at the centre and as a spine – something Sorrell largely resisted. He wants WPP to employ technology, and other business processes, consistently across the group and use the umbrella brand to drive collaboration and present a simpler, unified offering to win new business. WPP’s struggle to articulate "horizontality" as an integrated offer under Sorrell contrasted with the way in which Publicis Groupe did a better job of communicating both internally and externally, by bringing all its agencies under Publicis branding and using "Power of One" as a strategy. Two of Read’s first appointments have signalled his intent to unify WPP. He promoted Stephan Pretorius to be its first chief technology officer and poached Laurent Ezekiel from Publicis Groupe to be the first chief marketing and growth officer. Ezekiel, who will join in the spring, was a key player in Publicis Media’s GSK win and brings experience of North America, WPP’s largest and worst-performing market. "Perhaps [in the past] we’ve been too New York-centric," Read said at the annual results, pointing to Seattle, the home of Amazon, and Portland as important cities. The new chief executive has also created a global executive committee – something that Sorrell never set up – but WPP hasn’t identified who sits on it. Some insiders have raised eyebrows as it is said to have close to 24 members, which could make it unwieldy. "Given the structure of WPP and the number of companies, we felt that was the right number of people," Read says. He has also talked about the need for cultural change and greater openness at WPP. The UK mean gender pay gap was 23.7% last year, only a slight improvement on 25.5% in 2017. "We have to do better," Read admits. When Scott spoke at the investor day, he revealed some shocking figures about how WPP agencies have been struggling across much of the group. During Sorrell’s final year in charge, only three of the top 10 WPP companies grew organically, only eight out of WPP’s top 20 countries grew and only 12 out of the top 30 clients expanded their business with the group, according to Scott. Helliwell says, "The root cause of today’s woes is that the market has disrupted by moving to digital, personalized marketing faster than many of WPP’s key brands have been able to adapt." Despite WPP underperforming peers, Helliwell believes "it’s not company-specific, although WPP’s historic management incentivisation on prioritising margins over revenue growth may have made adaptation harder for them". Read says he is "starting to shift the emphasis on incentives" to net sales growth. Industry attention has focused on the need to turn around WPP’s creative agencies, which "remain under pressure". The WPP camp concedes the Wunderman Thompson and VMLY&R mergers may have looked bumpy from a UK perspective but it maintains they have run more smoothly elsewhere. There has been no radical surgery on Ogilvy or Grey yet. Read has talked about the importance of investing in creativity and has set aside an extra £15 million a year to recruit creative talent. He has repeated that message internally, for example, by emailing staff to highlight the involvement of WPP agencies in six ads during the Super Bowl in February. He also took a pause from the financials during the results presentation in March to show three ads, all from North America. "Creativity is our differentiator. Technology is our growth driver," he said. Significantly, Read, a former chief executive of WPP Digital, has urged the company to stop using the word "digital," arguing there is a risk it is leading to siloed behaviour when the use of technology should be pervasive. The group’s biggest profit engine and source of cashflow is Group M, its media-buying arm, yet it barely featured at the investor day or behind closed doors at a three-day, internal global strategy meeting in New York in October. Read, who did praise Group M at the March results, should be careful "not to take his eyes off the thing that’s helping to hold WPP together," one agency boss says. Wavemaker, which was created by the defensive, internal merger of MEC and Maxus at the start of last year, has underperformed and been without a global chief executive since December. Mindshare also had a tough 2018. MediaCom has been a bright spot for Group M, which has made one notable, recent hire by recruiting top Wall Street analyst Brian Wieser to be global president of business intelligence and a much-needed fresh voice. Rethinking how Group M "goes to market" and simplifies its suite of products is likely to be on the agenda for Read, who has insisted that the debate about media agency transparency has not hit WPP’s U.S. performance. He and Scott have promised to co-locate more agencies in the same building in a "campus-style" set-up to drive efficiencies and improve collaboration and have cut back on acquisitions. Read has promised to hold the dividend, cut costs, and stabilize the business, and some of the hedge funds that were betting against the shares have eased back. There is a widespread view among investors and inside WPP that the 2018 results that Read presented on March 1 "belong to his predecessor" and "he really starts now" in terms of the company’s performance. Read made one slip early in his tenure when he modestly upgraded his growth forecast last September, only to cut it at the end of October, and investors punished the shares. Enders believes US-China trade friction and Brexit have added to WPP’s problems. "This year has been more difficult than they anticipated in terms of the global macro-economic situation," she suggests. Few at WPP seem to mourn Sorrell’s departure; the business was struggling in his final year and he has been so critical of the company since his departure. His undoubted power to woo clients had also waned as the numbers faltered, according to several WPP agency leaders. One global boss, who also has no regrets about Sorrell’s exit, says that he has nonetheless left a big gap: "Probably what WPP misses and the industry misses about Martin is that he was a spokesman for the industry – whether you agreed or disagreed with him – and I don’t think he’s been replaced by anyone else. The mere fact that Campaign is asking about WPP ‘one year later’ is proof of that." Read has been adamant that WPP does not need to be broken up, but the halving in the share price has made it a takeover target for private equity or an IT or consulting group. Warren Buffett made a £9.25p-a-share offer at a 15% premium in 2012 but was rebuffed, according to Sorrell when he spoke at a Campaign breakfast last November. Read is a WPP loyalist but he knows the turnaround is going to take years, and Enders thinks that if a buyer comes knocking, he would be coolly unemotional. "If Mark has an offer of the same kind as Warren Buffett made, he will sell quickly," she predicts. "He has been at WPP a long time but he doesn’t have that same feeling that the share price is his blood pressure – as Martin did." Read won’t comment but there is no doubting his commitment to turning around a company he first joined 30 years ago. "I enjoy a challenge," he says. "The longest-serving FTSE CEO became the fastest comeback kid" is how Lorna Tilbian, chairman of stockbroker Dowgate Capital, describes Martin Sorrell’s astonishing fall from power at WPP and his equally dramatic return to the fray as founder of S4 Capital. "He is optimistic and excited by having a blank canvas and to start afresh and create his new business," Tilbian, whose business acts as broker for S4 Capital, says. Sorrell floated his new company on the stock market within three months of leaving WPP and has already done two significant deals, buying MediaMonks and Mighty Hive, as part of a strategy to build what he calls a "new age, new era digital advertising and marketing services business." He has also repeatedly attacked WPP’s leadership since his exit and criticized the five-month search for his successor last year. Legal letters have flown in both directions as WPP warned Sorrell’s decision to outbid his old company for Media Monks meant he might jeopardize his long-term share awards to which he was entitled. 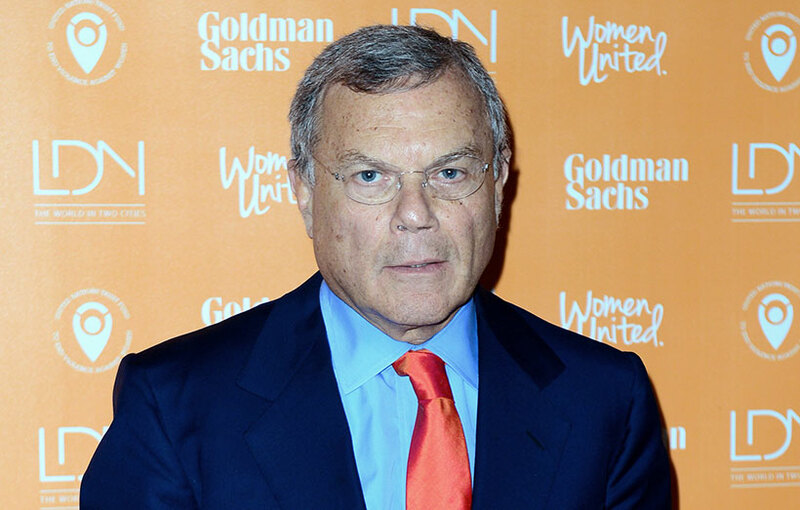 Sorrell, who turned 74 in February and earned more than £200 million in his last five years at WPP, left after an investigation into allegations of personal misconduct. There were subsequent reports that the company looked at whether he had used its money to pay a prostitute. Sorrell vehemently denied all the allegations. He went on to repay £170,000 in expenses to WPP in January. Tilbian says Sorrell has little time for regrets. "I don’t know any startup where the CEO is as busy on the [international] circuit where every FTSE-100 CEO is," she adds. But Claire Enders, founder of Enders Analysis, says Sorrell must know he bears responsibility for the way WPP ran into financial difficulties in his final year in charge. "I’ve been pleasantly surprised that he’s been able to get going again so decisively," Enders says. "His life hasn’t changed that much. He’s having a pretty similar life, doing similar things [as when he was at WPP] – just not on the same scale and not with same people." She adds, "No-one who knows Martin is surprised that he can’t sit on his laurels. He just sees more laurel to be acquired." Sorrell had a remarkable record at WPP, using acquisitions to turn a shell company in 1985 into the world’s biggest advertising group. It was worth £24 billion at its peak at the start of 2017, before things went badly wrong. By ploughing £40 million of his own money into S4 Capital and making some shrewd buys, Sorrell has created a new narrative and a growth story for himself. But he keeps colliding with WPP, whether it’s MediaMonks pitching against his old company to win Procter & Gamble’s Braun or opening a London office practically next door to WPP’s AKQA. As for his legacy at WPP, one observer says the new regime was always likely to blame the old regime – and vice versa. The saga continues. WPP was the worst performer of the agency holding companies in 2018, although, arguably, it did no worse than Publicis Groupe. Mark Read has said it will take until 2021 for WPP to match the average organic revenue growth of its peers – probably about 3%, although he refuses to give an exact target. WPP reports two measures of growth. Net sales, known as revenues less pass-through costs, fell 0.4%, and total revenues, including pass-through costs, rose 0.8% on a like-for-like basis last year. Most other groups disclose only total revenues. Publicis Groupe, reporting its first full year under the leadership of chief executive Arthur Sadoun, had organic revenue growth of 0.8%, although that figure excludes discontinued health operation PHS. Growth was just 0.1% including PHS. Interpublic was the star performer, as veteran chief executive Michael Roth increased organic revenue by 5.5%. Japan’s Dentsu Aegis Network had 4.3% growth during Jerry Buhlmann’s last year as global chief executive. And Omnicom, under John Wren, the longest-serving of the holding company chiefs, generated growth of 2.6%. Vivendi’s Havas, the smallest of the big six ad groups, had 0.1% growth in net sales and a 0.5% increase in revenues. Read admits the superior growth of IPG and Omnicom, in particular, is "not lost on us" and suggested three areas where "we can do better." These are: getting a better balance between revenue and margin growth, investing more in creativity and talent, especially in the U.S., and simplifying and integrating WPP. Still, some observers wonder whether WPP and Publicis Groupe have been underperforming because their internal M&A has been a distraction from bringing in revenue. "One plus one does not always add up to two or two and a half," one senior figure suggests. "Sometimes it adds up to one and a half, at least in the short term, even though mergers might be the right thing to do." In a sign of the scale of the disruption at WPP, it ran up £302 million in restructuring costs and a £148 million impairment charge on the value of VMLY&R last year. Panmure Gordon analyst Jonathan Helliwell says overall revenue growth in the agency sector offers hope for WPP’s turnaround. He adds: "The long-term outlook for the sector is still bullish, since digital will drive further innovation – a proliferation of new companies needing to market, a proliferation of new ways to market, and a need to pull together personalised marketing, digital interactions with customers, and yes, good old-fashioned brand building." New buyers such as Accenture Interactive, You & Mr Jones, S4 Capital and private equity firms also support Read’s argument that marketing services are facing structural change, not structural decline. This feature first appeared on campaignlive.co.uk.